An injury-time winner saw newly-promoted Brentford come from behind to beat Fulham and move to within one point of Championship leaders Derby. Spanish substitute Jota struck a deflected winner to earn the Bees a fourth successive win and move them up to fourth. Hugo Rodallega put the visitors ahead against the run of play from close range on 57 minutes. Harlee Dean shot into the top corner to level before Jota's intervention. It was the first west London league derby between these two sides for 16 years and the hosts dominated from the start. Only wayward finishing and good goalkeeping by Fulham's Marcus Bettinelli kept the visitors, who were previously unbeaten in six matches, in the game. However, Dean's slip just before the hour mark allowed former Leeds man Ross McCormack to slide Rodallega in for Fulham's opener as the Cottagers threatened to continue their recent run of good form. But, buoyed by a sold-out Griffin Park, Mark Warburton's side hit back as their high-tempo style finally paid dividends. Dean fired into the roof of the net to level with nine minutes left before Jota sealed victory. 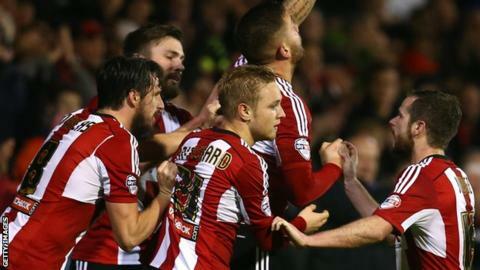 Match ends, Brentford 2, Fulham 1. Second Half ends, Brentford 2, Fulham 1. Attempt saved. Jota (Brentford) left footed shot from the right side of the box is saved in the centre of the goal. Assisted by Alex Pritchard. Foul by Alex Pritchard (Brentford). Attempt saved. Nick Proschwitz (Brentford) right footed shot from outside the box is saved in the bottom left corner. Assisted by Alex Pritchard. Goal! Brentford 2, Fulham 1. Jota (Brentford) left footed shot from outside the box to the bottom right corner. Assisted by Alan Judge. Attempt saved. Thomas Eisfeld (Fulham) right footed shot from the right side of the box is saved in the bottom right corner. Assisted by Hugo Rodallega. Hand ball by Scott Parker (Fulham). Attempt missed. Hugo Rodallega (Fulham) header from the centre of the box misses to the right. Assisted by Thomas Eisfeld with a cross following a corner. Corner, Fulham. Conceded by Tony Craig. Attempt blocked. Lasse Vigen Christensen (Fulham) left footed shot from outside the box is blocked. Assisted by Ross McCormack. Corner, Fulham. Conceded by Alan Judge. Substitution, Brentford. Nick Proschwitz replaces Andre Gray. Goal! Brentford 1, Fulham 1. Harlee Dean (Brentford) right footed shot from the centre of the box to the top right corner. Assisted by Stuart Dallas with a cross. Corner, Fulham. Conceded by David Button. Attempt saved. Hugo Rodallega (Fulham) right footed shot from the right side of the box is saved in the bottom right corner. Assisted by Thomas Eisfeld with a through ball. Substitution, Brentford. Jota replaces Toumani Diagouraga. Substitution, Fulham. Thomas Eisfeld replaces Bryan Ruiz. Foul by Tony Craig (Brentford). Bryan Ruiz (Fulham) wins a free kick in the defensive half. Attempt blocked. Harlee Dean (Brentford) left footed shot from the left side of the box is blocked. Attempt missed. Jonathan Douglas (Brentford) header from the centre of the box misses to the right. Assisted by Alan Judge with a cross following a set piece situation. Hand ball by Lasse Vigen Christensen (Fulham). Corner, Brentford. Conceded by Elsad Zverotic. Corner, Brentford. Conceded by Nikolay Bodurov. Foul by Hugo Rodallega (Fulham). Attempt missed. Alex Pritchard (Brentford) right footed shot from outside the box misses to the left. Assisted by Alan Judge. Attempt missed. Stuart Dallas (Brentford) right footed shot from the centre of the box is too high. Assisted by Alan Judge with a cross. Substitution, Brentford. Stuart Dallas replaces Jon-Miquel Toral. Goal! Brentford 0, Fulham 1. Hugo Rodallega (Fulham) right footed shot from the centre of the box to the centre of the goal. Assisted by Ross McCormack.